LONG BEACH — Seattle-based Foss Maritime Co., a Port of Long Beach tenant, was awarded a $51 million contract to construct two new advanced-technology fireboats for the Port of Long Beach to be used at Fire Stations 15 and 20. The pair of boats, expected to cost $64 million upon completion, will replace two of the port’s aging fireboats, Liberty and Challenger, and will be approximately 105 feet in length with a pumping capacity of 35,000 to 40,000 gallons per minute. Foss Maritime has outlined a three-year project, and it is expected to deliver the first fireboat by mid-2014. One of the boats is being funded in part by grant funds from the Department of Homeland Security, which awarded $18 million to the project. “The grant funding we received is only to be used for one boat, and those funds have to be spent by the middle of 2014 – so, we have a very tight timeframe for fabrication of first boat,” said port operations manager Sean C. Strawbridge. The second boat’s completion timeframe will be based more on finding funding through the port’s current budget and possible future grants. “We are committed to constructing two boats irrespective of whatever additional grant funds we are able to procure,” Strawbridge said. The cost of the boat is higher than originally expected, as the port engineer had listed the projected cost of the two fireboats at $43.9 million prior to the Aug. 30 advertisement for bids. The shortened construction timeframe for the first boat, along with the port’s special design requests brought in only two bids: one from Foss Maritime for $51 million and one from Canada-based Hike Metal Productions for $61 million. Strawbridge noted that Foss Maritime’s history of boat fabrication and special Voith Schneidler propeller technology were both taken into account in the selection of the company for the project. Hike Metals Productions’ bid was found to not be adequate, as the listed construction cost did not include taxes as stipulated in the Bid for Proposals. “I would have hoped the fireboats would be constructed sooner and for less money,” said Commissioner Rich Dines. “But I support this very much — and it’s not only lives these fireboats protect, but also the port’s assets. The new fireboats are due, in part, to the Long Beach Harbor Commission’s January 2008 request to the Long Beach Fire Department to improve and upgrade the fire safety facilities and fire services in the harbor district. 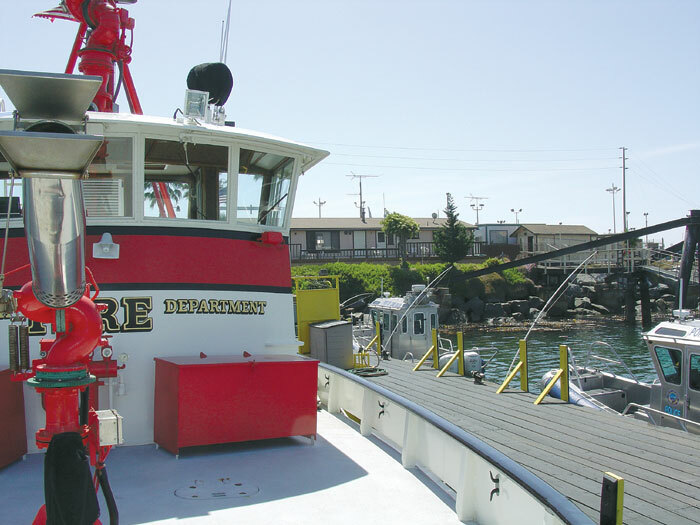 A 2010 assessment study conducted by Citygate Associates and presented to the Engineering and Environmental Committee recommended replacing Challenger and Liberty with two new fireboats to enhance the department fire response capabilities. According to Strawbridge, the old fireboats were constructed in the early to mid-1980s and are beyond their useful life. The new boats will be constructed with a 25-year life expectancy that Sarjeant believes can be extended with proper maintenance and management.